While I write about all this stuff I am learning in the Yin Yoga Teacher Training, I would like to say that I need to reserve the right to amend or correct anything that I post about. I am typing off the top of my head as a learning tool. Then I review my notes and revise my writing. My notes are not complete as I cannot write everything down that is being said and sometimes someone will ask a question and the answer takes us WAY off the path that we were on but the information is interesting so the notes get jumbled when the person teaching us tries to get back onto the path they were going down. So much information! 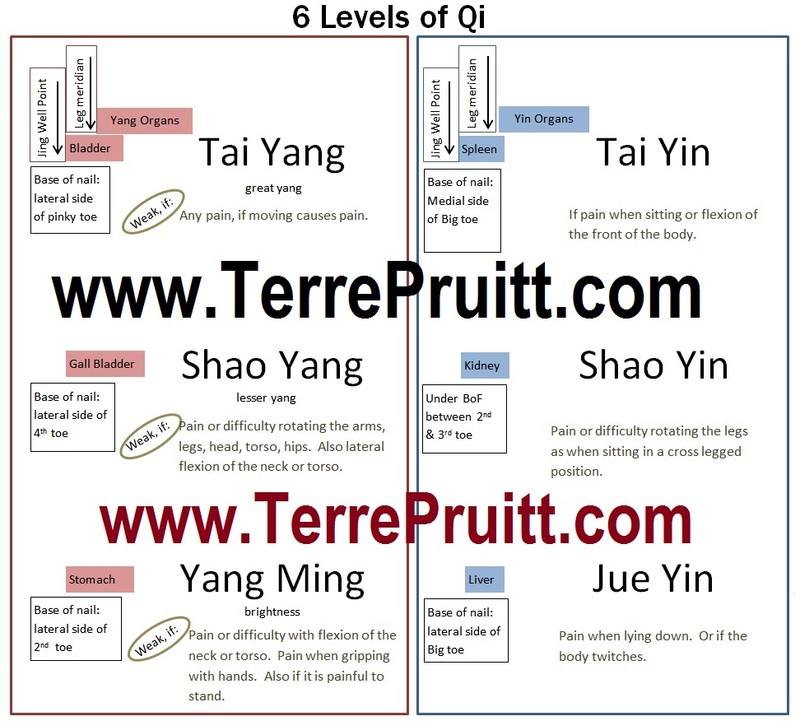 In conjunction with the Module regarding the Yang Leg Sinew Channels we reviewed the six divisions or levels of Qi. There are the levels of Yang Qi and Levels of Yin Qi. The Yang Levels are Tai Yang, Shao Yang, and Yang Ming. The Yin Levels are Tai Yin, Shao Yin, and Jue Yin. Each level has associated “organs” and associated meridians. The levels have two organ associations, the yang levels have yang organs and the yin levels have yin organs, and each level has a leg and an arm meridian associated with it and it’s corresponding organ. 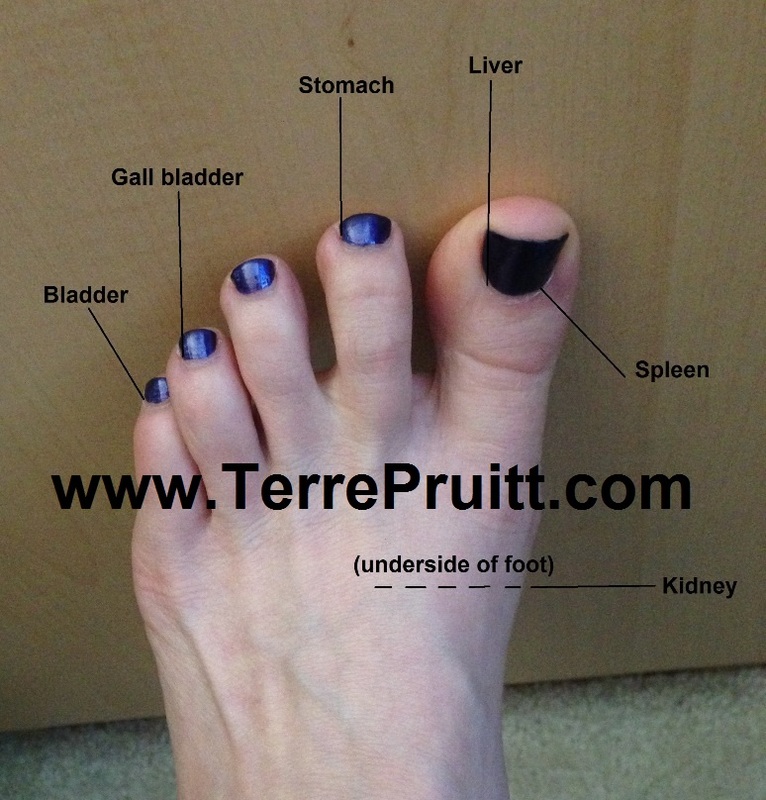 The organs associated with Tai Yang are the bladder and the small intestine. The organs associated with Shao Yang are the gall bladder and triple heater. The organs associated with Yang Ming are the stomach and large intestine. The organs associated with Tai Yin are the spleen and lungs. The organs associated with Shao Yin are the kidneys and the heart. The organs associated with Jue Yin are the liver and pericardium. Since I have not yet posted about the hand jing well points and we have not even reviewed the arm meridians I did not include them on the attached chart. I probably should have since I will have to redo it to include them. I just wanted the organs that I have posted about on it so that there wasn’t too much information. There is so much information, I seem to do better having it in pieces. As you can see from the chart and you can probably figure out the organs and meridians are the same. I’ve noted the jing well points of each meridian so that I can have that in my mind. With each level there is associated issues when there is weakness in that level. Weakness of the Tai Yang could show up as any pain, if moving causes pain. Weakness of the Shao Yang – Pain or difficulty rotating the arms, legs, head, torso, hips. Also lateral flexion of the neck or torso. Weakness of the Yang Ming – Pain or difficulty with flexion of the neck or torso. Pain when gripping with hands. Also if it is painful to stand. Weakness of the Tai Yin – If pain when sitting or flexion of the front of the body. Weakness of the Shao Yin – Pain or difficulty rotating the legs as when sitting in a cross legged position. Weakness of the Jue Yin – Pain when lying down. Or if the body twitches. One way to help with the weakness is to do Yin Yoga to help get the Qi flowing. 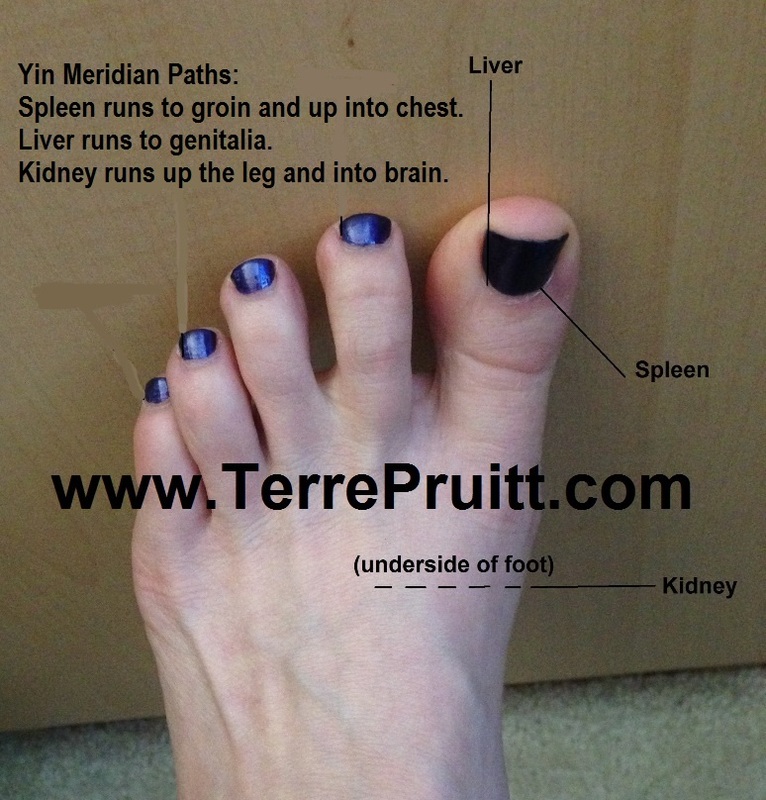 Knowing which level is associated with which organ and meridian is how that can be addressed. But if you are practicing Yin Yoga the idea is to get the Qi flowing smoothly throughout the entire body so one doesn’t even have to focus too much on which level might need it. A well rounded class should get to all of it. These levels though, can give us, as teachers, a general map as to how to design a yoga class. A class in the morning might want to go from Jue Yin to Tai Yang as the types of poses affecting Tai Yang are more invigorating. But an evening class might do poses to affect the meridians and levels in reverse. From invigorating to more calming. It is all just tools to help us design classes that will have our students feeling fabulous when they are done. It is all so interesting to me. I hope you are enjoying the little peak into Yin Yoga and what it entails.